It's almost that time of year again. In one of the more dramatic yet tragic events of the natural world, salmon leave the open ocean and home in on their natal streams. Struggling upstream rivers and tributaries, they heroically return to the suburban backwaters from whence they came, only to spawn and die. Then there's the steelhead, the perennial boomerang children of the salmon world. They spawn, grow up, leave for the big ocean (everybody knows there are more fish in the sea), and then return and return again—when there's a home to return to. It's no joke that decades of crude land management have fouled fish habitat—yes, even in bucolic wine country. Cultivating image as assiduously as their vines, wineries nowadays position themselves as the most benign agricultural enterprises. But it hasn't always been so. Just ask Wine Creek—or ask winemaker Steven Canter, who explains that the creek that bisects Quivira Vineyards merely served as a convenient drain during the last century. Reportedly, it got its name because it ran red with winery effluent during harvest. Former Quivira owners Henry and Holly Wendt began habitat restoration on Wine Creek a decade ago, and created the Steelhead Red wine brand, proceeds of which help to fund Trout Unlimited. They installed weirs, or manmade rock ledges, to create fish-friendly pools and encourage deposits of gravel that are crucial for spawning. Willow trees were planted to provide shade and help control erosion, and barriers to migrating fish were removed. When Swirl 'n' Spit last stopped by Quivira in February 2006, small fry were swimming in Wine Creek, and newly certified biodynamic wines were still slumbering in the cellar. Since then, the steelhead have grown up and returned to spawn (they even have their own YouTube video). There have been other changes. New owner Pete Kight has enthusiastically picked up the cow horn where the Wendts left off, and winemaker Canter approaches biodynamics with a musician's spirit and a surgeon's scalpel: while biodynamic preparations can now be bought off the shelf, he says biodynamics are like the chords of a jazz standard—the point is to riff on them in tune with the vineyard. Instead of harvesting vineyards in "blocks," he divides them into dozens of picks according to the natural contour of the land. The resulting wines have both finesse and broad appeal. The 2006 Dry Creek Valley Zinfandel ($20) whispers rather than shouts "Dry Creek Zin." The stainless-steel-fermented 2007 Fig Tree Vineyard Sauvignon Blanc ($18) derives intensity from lemongrass and herb aromas, rather than aggressive fruit or acidity. When Canter parsed out the varietal components of the former version of Steelhead Red, he thought the Mourvèdre had more potential than it was showing. With a little micromanaging, the 2006 Wine Creek Ranch Mourvèdre ($32) became a triumph of dense black cherry with a long, savory finish. No one ever guesses that the irresistibly juicy, silk-bodied, gold-medal winning 2006 Wine Creek Ranch Grenache ($26) nearly tops 16 percent alcohol, all of which make the as-yet unreleased Syrah and Rhône-style blend quite promising. Once again we find, as have the steelhead, that Quivira is worth returning to, year after year. Quivira Vineyards, 4900 West Dry Creek Road, Healdsburg. Open daily, 11am–5pm; tasting fee $5. 707.433.8333. Steelhead Dry Creek Valley Zinfandel ($16) is available for sale but not tasting, and can also be found in Safeway and Von's stores. 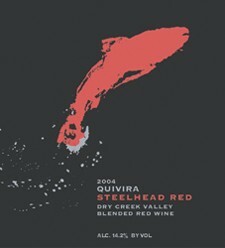 For more info, visit [ http://www.steelheadwine.com/ ]www.steelheadwine.com.